Users can overlay different layers of data for analysis of locations. Data was collected with a simple GPS unit and imported as an x,y event layer. Hazardous spill first responders and incident commanders can make better decisions. The Nevada Division of Environmental Protection (NDEP) and the California Department of Fish and Game Office of Spill Prevention and Response (OSPR) recently began a cooperative project to create geographic response plans (GRPs) for the Lake Tahoe and Truckee River, Carson River, and Walker River basins from available GIS data layers. These basins border California and Nevada and fall under the U.S. Environmental Protection Agency (EPA) Region 9 for spill and emergency response. GRPs are a collection of maps used by emergency response personnel to assess the quickest way to respond to any type of potentially hazardous emergency situations, such as spills from a gasoline tanker overturning on a bridge, a railcar derailment, or an aircraft crash. 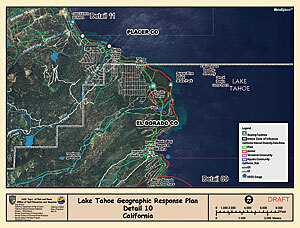 This shows a detail map from the Lake Tahoe Geographic Response Plan (data is GlobeXplorer imagery). NDEP and OSPR used ArcGIS to create the maps in GRP. Both agencies have used Esri products for many years. NDEP has set Esri software as the division standard for GIS software. GRPs for either state needed to have a similar design, so communication and cooperative design efforts were critical to the success of the project. Similar design of GRPs was important because if a spill were large enough, both states could be working on the same spill at the same time. A consistent GRP would allow crews from both states to develop response plans much quicker. For the Truckee, Carson, and Walker river basins, NDEP and OSPR were responsible for the GRP for the geographic areas located in their respective states. Since Lake Tahoe spans the California/Nevada border, a series of seamless maps was developed. In the planning meetings, it was determined that NDEP and OSPR were the prominent agencies that had experience using GIS software and had the staff available to commit to this project. GIS software was chosen to create GRP because it allows users to overlay different layers of data for analysis of a certain location. The software also allows end users to create maps to communicate events at specific locations. Examples from GRP include the location of access points (where responders could access the stream with equipment) and public water supply intakes, as well as what sensitive species may be affected by a hazardous spill. The participating agencies and responders were asked what information they would like to see on the GRP maps, especially for those responding first to emergency situations. Some data layers, such as pipeline locations and archaeological sites, were requested but were not included on the maps due to federal and state homeland security issues. Several other layers, such as sensitive, threatened, or endangered species, were added with buffers to provide a sense of ambiguity to the specific location of the species. For layers that were sensitive in nature, NDEP, OSPR, and EPA worked diligently with the data holders to ensure that concerns about the data were addressed. The GRP for the Lake Tahoe and Truckee, Carson, and Walker river basins begins with a general reference map and an index map for each basin. The reference and index maps are designed for an 11- by 17-inch page size. Data included on the maps, such as roads, shaded relief, cities, streams, and water bodies, is clipped to the basin boundary. The index maps also show access points along the river where responders can easily get equipment, such as fire trucks and trailers, to the river channel. The access points were determined from maps, from knowledge of the local areas, and by field verification. Access point locations were collected with a recreational-grade GPS unit (accuracy of +/- 5 meters), entered into a spreadsheet, and imported into ArcGIS as an x,y event layer. Following the general reference and index maps are detail maps for each specific basin. Detail maps for the Truckee River Basin used 1:24,000-scale United States Geological Survey (USGS) topographic quadrangles as a base layer. Detail maps for the Carson and Walker river basins used 1:100,000-scale USGS topographic quadrangles in digital raster graphics (DRG) format as the base layer. Additional layers, such as access points, USGS real-time stream-gauging sites, sensitive species, and roads, overlaid the base layer. USGS real-time stream-gauging sites are a very useful tool for emergency responders when a hazardous spill happens in or near a river because the flow recorded at those sites is updated continuously and can be viewed in the field from the USGS Web site. For the Lake Tahoe Basin, GRP also includes a map showing the fire districts. Detail maps for the Lake Tahoe Basin in Nevada used a 10-meter shaded relief layer and 1:100,000-scale USGS topographic quadrangles as the base layer. The quadrangles were overlaid on the shaded relief data to give the appearance of terrain. Detail maps for the Lake Tahoe Basin in California use current imagery from GlobeXplorer for the basemap and display the same data as the topographic detail maps in the other basins. ArcGIS software's role was critical in helping hazardous spill first responders and incident commanders make better decisions. The cooperation and communication between two different state agencies was critical in sharing geographic data and creating maps for GRP. This cooperation enabled both states to use their own existing data in addition to distributing the labor for map creation, which saved each state considerable time and money. Planning meetings, facilitated by EPA, opened the lines of communication between the states and the agencies involved in the plans. By communicating their capabilities and exchanging ideas and prototypes, NDEP and OSPR were able to create a cohesive GRP for all the project areas. The GRP maps, as well as the geographic datasets collected, are shared between NDEP and OSPR. This enables a secure backup copy of the data. John Watermolen was the GIS specialist for NDEP. He currently works with the Nevada Division of Forestry in Carson City, Nevada, as the GIS coordinator. Mark Lampinen is a GIS analyst for the California Department of Fish and Game Office of Spill Prevention and Response in Sacramento, California. For more information, contact John Watermolen (tel. : 775-684-2530, e-mail: jwatermo@forestry.nv.gov) or Mark Lampinen (tel. : 916-322-4777, e-mail: mlampinen@dfg.ca.gov).